I just stumbled across it and I’m so glad that I did. I’m from San Antonio TX and I love Old School Wrestling. I’m only 26 so I didnt grow up with it but I come from a City that loved and cherished every moment Paul Boesch gave to them in the Hemisphere Arena. Blackcat and Dre I feel like i gained two new friends, now excuse me I must catch up on old episodes. WahooCHOP! I love your podcast! It’s my new obsession. Greatest wrestling podcast ever! The love Dre and Black Cat have for old school wrestling is contagious and has prompted me to go back and watch many of the classic matches I remember watching as a child. I grew up on Jerry Lawler and Memphis wrestling. I remember watching every Saturday at noon with my father. Whenever the action got out of hand and spilled outside of the ring, my father would get excited and sit on the edge of his seat while rubbing his hands together like a mad man. I remember getting caught up in the excitement like it was yesterday. We were also one of the first families in my neighborhood to get cable, primarily so my dad and I could watch NWA on the superstation WTBS. Keep up the great work of keeping the true spirit of wrestling alive. You guys should really review the classic original Tupelo Concession Stand Match from 1979 between Lawler/Dundee and the Blonde Bombers (Farris/Lathem). I just meet hacksaw jim duggan last week and got him to record and intro to the show and I am wondering were should a send it. To. What a great show! Just downloaded one of the Primetime Wrestling episodes for a road trip! So glad I did! It was a real treat getting to take that trip down memory lane with you guys! I loved hearing the descriptions of some of the lesser known announcers especially! Hilarious stuff! And I totally remember the B Team announcing squads! Cringe worthy, but awesome! You guys rule! I hope to get the box sets soon. 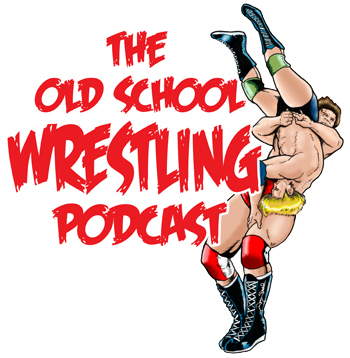 Listener to OSWP since Season 1. I purchased one of the posters and have it proudly displayed in my basement bathroom (my wife loves it) Keep up the great work fellas! Thank you! We appreciate your long time support!